What is the current Italian situation regarding the implementation of BIM in the country? What are the decisions of the Italian government regarding the digital revolution in the construction industry? In this changing scenario, characterized by the acclaimed adoption of BIM throughout the world, the need to establish the basic concepts and methods of the process is almost logical. The buildingSmart international arose as an organization to guide the development of openBIM (IFC) standards. We are talking a about a real global reference point for learning the openBIM competence. The BIM Task Group is another good example to analyze the efforts to create common guidelines and promote the digital change in the construction industry. The Task Group’s vision is to encourage the common use of BIM, as ‘digital construction’, in public works with the common aim of improving value for public money, quality of the public estate and for the sustainable competitiveness of industry. In Italy the mandatory implementation time of BIM is organized in three phases. BIM will be mandatory from 2019, only for works valued at more than 100 million euros. From 2019 to 2022, the BIM implementation strategy envisages the extension of the BIM parameters’ progressive obligation also for those particularly complex constructions requiring particular safety standards, regardless of the economic value of the project. From 2022 the mandatory use of BIM is foreseen for all construction projects. Last October the Digital&BIM Italia – the unmissable event on «innovation and digital transformation of the industry and the built environment» – had taken place. This has been the first and most important Italian event dedicated to the digital transformation of the construction sector. It has been an invitation to reflect on the new protocols and tools related to BIM, as well as on successful practices in Europe. 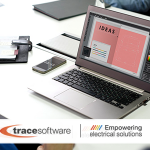 Trace Software International, always in the forefront of innovation, attended the event together with its partner BIM&CO to present its new software elec calc™ BIM. 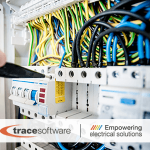 elec calc ™ BIM stands out for being the only electrical CAD software capable of meeting the challenge of the digital revolution of the construction industry, otherwise known as BIM, and satisfying its demands. This is the first calculation software that perfectly integrates elec calc ™ – the instrument used for the sizing of electrical systems – with different drawing software, allowing the import of the digital model in ICF4 format generated by any 3D architectural software (Revit, Archicad …). You can run several simulations to compare possible routing alternatives. The 3D model allows you to detect if there are collisions and if this happens, the information is sent directly to the designer thanks to the BIM Collaboration Format (BCF) so you can solve the problem and correct the model. The user of elec calc™ BIM will be able to access all the information and data concerning the BIM objects of the BIM&CO platform. elec calc™ BIM promotes synergies and interoperability to improve design reliability and safety, as well as project quality and overall construction management. The multi-selling points of elec calc ™ Why is corporative culture a strategic advantage?